The four knobs and one switch are clearly labeled and color coded. The pedal’s controls are intuitive. The main drawback is that only half of the pedal’s sounds can be accessed at once. There is a switch that can only be accessed by opening up the pedal the switch to the second bank of sounds. The Bubbletron has a lot of beautiful and musical sounds. The flange/phase/envelope options are all useful and can range from intense to subtle. The real limiting factor is the second bank switch in the pedal’s interior. This pedal speaks well. You can change the sensitivity and thus in some cases, the saturation. It does however, have a less dramatic effect that its intended use on guitar. That being said, the effects are unique and beautiful and worth your while. The lack of presets make this pedal slightly less desirable than others. However, the dynamic flanger and phaser serve the horn player well in that there is no oscillation of the effect when the pedal is not in use. 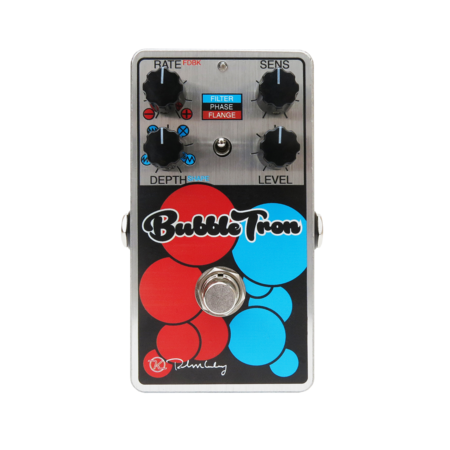 This eliminates the washy waves of sound one gets from most phasers and the oscillating sound that many flangers emit when you are not playing.